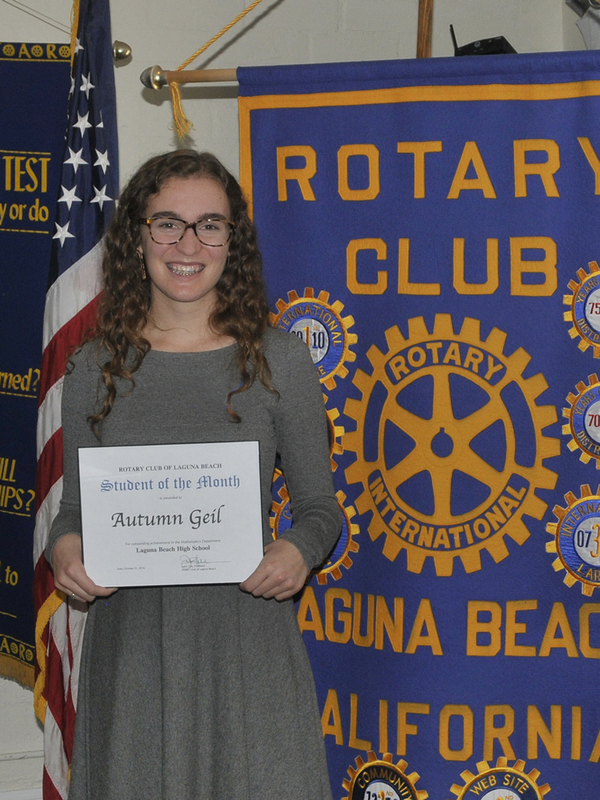 The Laguna Rotary Club recently honored Autumn Geil as November Student of the Month representing the Laguna Beach High School math department, says an announcement. Authumn is a National Merit Scholar, a 2016 Girls State representative, Regional Occupation Program distinguished arts student and on the Superintendent’s Honor Roll for the past three years. Autumn is also president of the math team and a five-year player for a nationally ranked soccer team. She also enjoys competing in voice competitions each year. Autumn plans to attend a four year university with interests in engineering, math and science. Members of the public are invited to attend a free instrumental music performance by Laguna Beach High School student musicians at 7 p.m. on Tuesday, Dec. 13, in the LBHS Artists’ Theatre, 625 Park Ave. The concert will feature wind and string ensembles directed by Jeremy Chung, and the jazz orchestra directed by Matthew Witek. “Come enjoy holiday music while supporting the arts and youth in our community,” says Kathleen Fay, president of the music boosters. ASSE International Student Exchange Programs is looking for local families to host boys and girls between the ages of 15 and 18 from a variety of countries including Norway, Denmark, Spain, Italy and Japan, who will attend Laguna Beach High School. Host families welcome the students as family members so that they can experience American culture while they practice their English speaking skills. The exchange students have pocket money for personal expenses and insurance. ASSE students are selected based on academics and personality, and host families can choose their student from a wide variety of backgrounds, countries and personal interests.